This project demonstrates the level of conceptual realism that can be arrived at in a very short amount of time by leveraging CAD to create a realistic design for a "looks-like/works-like" prototype and pitch deck. Concepts like these are generated quickly and cost effectively to provide a powerful foundation for initial project funding. This was a quick conceptual project built on the observation that patient cooling systems in the emergency department are expensive and cumbersome. The former makes them unaffordable. The latter makes them unusable in the ambulatory environment and difficult to use in the ED. This concept was conceived of and designed in one week. It was created in Solidworks using as many off-the-shelf components as possible for the rapid development of a works-like/looks-like proof-of-concept model. Following Sudden Cardiac Arrest, it is important to cool a patient to reduce trauma to the brain as the result of reduced or halted blood flow. Immediately upon entering the ED, patients are often packed in ice or hooked up to temperature management systems. Ice is a cost effective and ubiquitous method for patient cooling, but as it melts, it creates a mess and a hazard in the ED. Temperature management devices (e.g. Arctic Sun, et al.) are cumbersome, noisy and expensive. (In the gallery below, you'll see a photo of a BMW sticker stuck on such a device. Units like these cost as much as a luxury car.) Because these units use refrigeration, which requires AC power, cooling can only begin once a patient has reached the hospital. The devices must be unplugged for transport within the hospital, which temporarily suspends patient cooling. Even when using an expensive thermal management system, ED staff will regularly pack bags of ice around a patient. As these bags melt, equipment and surfaces become a slippery mess. Ice bags are placed in areas of high circulation, including groin, neck and underarms. High end temperature management systems rely on large, fluid-filled pads that circulate thermally-controlled sterile fluid. Units are so expensive, nurses adhered emblems of luxury cars to their housings as if to say "this costs as much as a BMW." Due to the high forces required to connect them, fluidic connectors can be challenging to operate. Because they require mains power, current temperature management units cannot go on a "road trip" with the patient to the imaging suite. This one is a Mercedes. There is an opportunity for an affordable solution to patient cooling that can be used in the ambulatory environment to begin cooling as early as possible following sudden cardiac arrest. 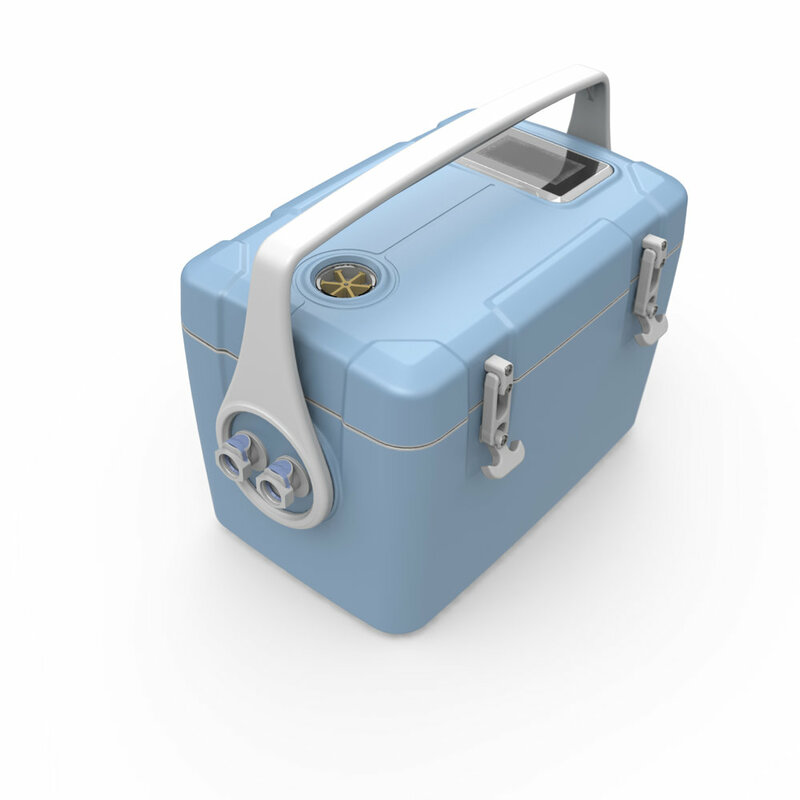 The design shown here utilizes ice — a ubiquitous resource in the Emergency Department — and a small heat exchanger built into a portable cooler. This design provides portable patient cooling that can start in the ambulatory environment. 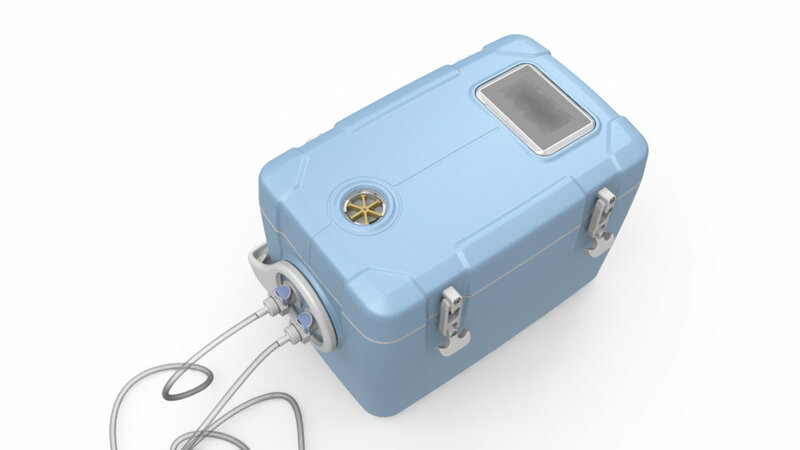 This tiny cooler can be transported easily by a single paramedic in an ambulance or by a nurse within the hospital, in the event that the patient needs to be transported (for imaging, for example). A closed loop temperature monitoring system maintains patient temperature dynamically and is set using a small off-the-shelf, impact-resistant touchscreen computer mounted in the lid of the device. An electrical flow meter with a mechanical paddlewheel indicator is also mounted in the lid of the device. This sensor monitors flow to/from the patient and provides an obvious visual indicator to the user that flow to the pads is happening. The unit incorporates 24ah of lithium polymer batteries in its base to provide shift-long performance and to lower its center of gravity.